You know how it goes: you eat all that food on Thanksgiving, and the next morning, there are all the leftovers in your fridge. If you’re intimidated by the idea of yet more cream on Friday morning, this whole-grain pancake recipe should be right up your alley. Don’t be scared off by the whole grain thing: the word “hearty” — which pretty much means “heavy” when we’re talking about whole grains — does not apply. 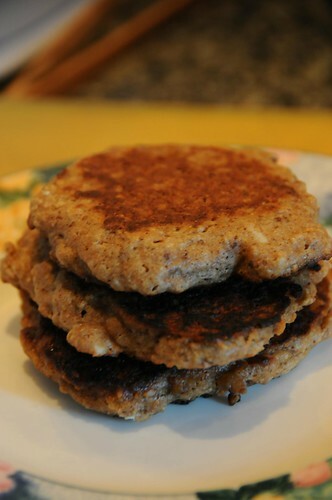 Instead, these are light and fluffy, with a tiny bit of crunch from the cornmeal. 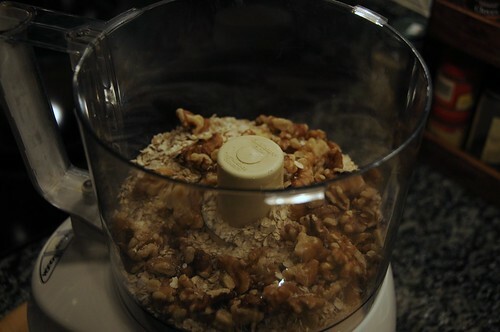 Put the oats and nuts into a blender or food processor and whir until they’re mostly smooth. A few little pieces of nut won’t hurt you, but you want it mostly flour-like in consistency. 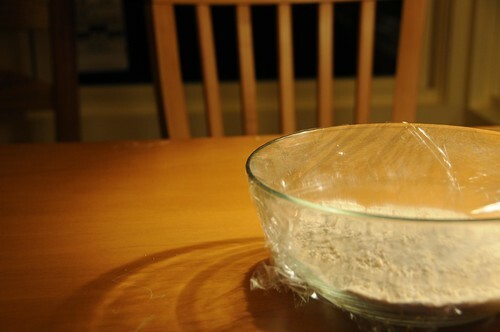 Add the flour, sugar, cornmeal, baking powder, baking soda, and salt, and stir to combine. You can do this part the night before, but if you do, you might get some funky lighting in your photo. Stick the butter in a Pyrex measuring cup and put it in the microwave to melt. 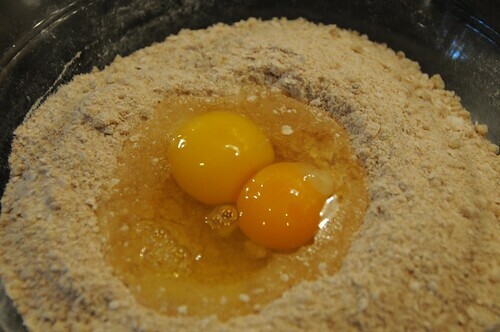 Add the eggs to the dry ingredients and just combine. (This won’t be anywhere near enough liquid to make a batter.) Now would also be a good time to start preheating the griddle or skillet you’ll use to cook the pancakes. Add the cold buttermilk to the melted butter in the measuring cup. The butter will form little droplets in the milk, which is exactly what you want. (I know it looks creepy, but it’s the secret to fluffy pancakes, I swear.) Pour the butter/buttermilk mixture into the other ingredients and stir to combine. The resulting batter will be very thick. Grease the griddle, and make sure the heat is no higher than medium. Use a 1/4-cup measure to scoop out the batter. Because the batter is so thick, I ended up using the bottom of the cup to pat it down into a more pancake-like shape. Cook on the first side until you see little bubbles in the center. The pancakes are cooked when the bubbles rise and pop (yes, you can help with your spatula), and the little holes they make remain open. When that happens, you can flip them. Trust me on this: if you flip them before this stage, you’ll get “squishy” instead of “fluffy.” The second side will cook more quickly, as it just needs to brown; it will do so most evenly if you flip the pancake onto a greased part of the griddle. Eat these with maple syrup* (and more butter, if you’re that kind of pancake person). You can store any extras in your refrigerator or freeze them, separated by layers of wax paper, for an easy (if slightly less crispy) breakfast later. *I love grade B maple syrup, which has a more intense flavor than the lighter stuff. Check your health food store or your farmer’s market for it. This looks great. I love ‘amber’ maple syrup, which is darker and more maple-flavoured than the prized ‘light’ variety.